"Healer" is a powerful word and YOU are a healer. or simply allow them the space to learn you make it possible for healing to occur. Today's call is to embrace the healer within. I am so so so so so so SO excited to announce this!!! On March 20, a very special guest post series will begin here at LilyWheel Slide. I like to think of it as a talking circle really. 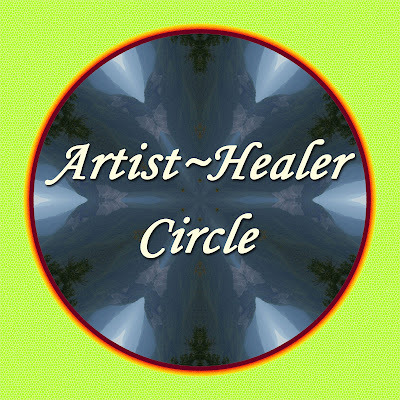 A circle composed of those who have come to consider themselves as both an Artist and a Healer. Whatever that means to them. We will begin to explore the connection of art and healing, human resiliency and potential within both of those realms - as well as challenges -, and personal story related to such. If you've been in a talking circle, you know what I mean. Think of it as passing the stick. When one person has the stick they speak their truth, their story, their questions, their insight. Everyone present listens and holds space for that truth to be shared, in support, in acceptance - understanding that each contributor has something of value to offer every other that visits the circle. I've experienced these circles in many ways myself - in women's groups, in sweat lodges and Sundances, in al-anon meetings and forums, at my grandma's kitchen table.... They always touch hearts and offer sweet release, revelation, validation, connection and inspiration. They are circles of practice in both giving and receiving, humility and openness. I have been trying for a couple of weeks to write a post that eloquently expresses the importance of this upcoming LilyWheel Slide offering... to no avail. But I realized why... because I need this circle of conversation as much as others. You see, I am an Artist and Healer. And I am beginning, for the first time in my life, to FEEL the inherent connection between these two powerful landscapes of self - to explore fully how they inform one another and sometimes become gracefully indistinguishable in the practice of Living. I also FEEL an undeniable rising of a need for this offering in our wounded world - a need that has yet to be fully named, recognized, understood and embraced. This need is picking up momentum. While I FEEL so much in regards to the potency of this, every day as I experience it more fully, I recognize a greater truth - that we, Artist~Healers, also need each other - to gather, to nurture, to postulate, validate, listen, remain open, support, and explore the power we all sense and FEEL in the expression of art and healing. We need each other as much as the world needs us. I recognize that I have so much to learn in this. I recognize that I am incapable of expressing everything that I FEEL about this amazing area. I will never be able to sum it up myself. As brave Artist~Healers on this path of discovery. I hold a treasure piece of my truth, that is meant to shine in honor with the treasure of each amazing contributor for the Artist~Healer Circle. in order to share these truths, in service and love, in just the way the world needs. And that just thrills me - like vibrating energy, goose-bump, awesome chill thrills!!! I am honored to host this space and hope you will join the circle to read the posts and be inspired. There will be 3-4 posts monthly - 2012 is nearly full already! !